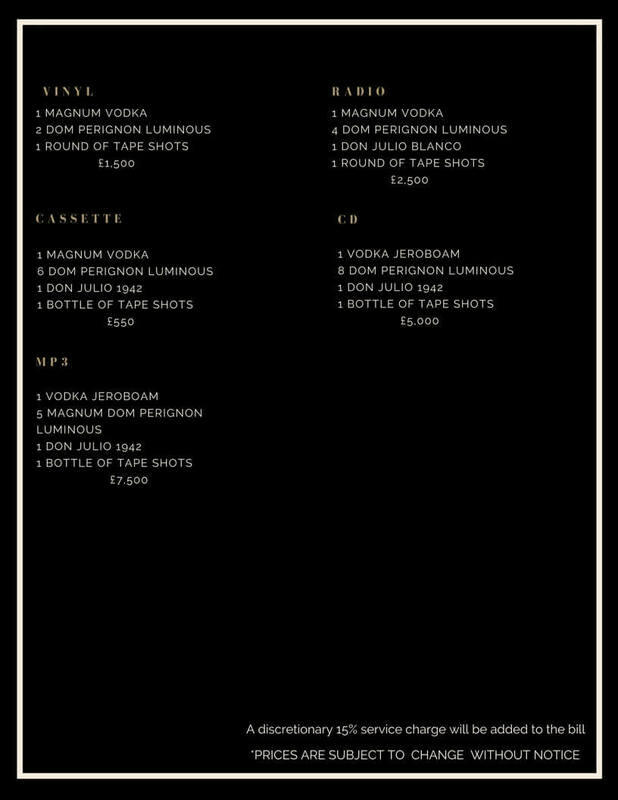 When you are out partying in one of the most popular clubs in London, once of the most common concern is actually what is the Tape Club Bottle Price Menu. 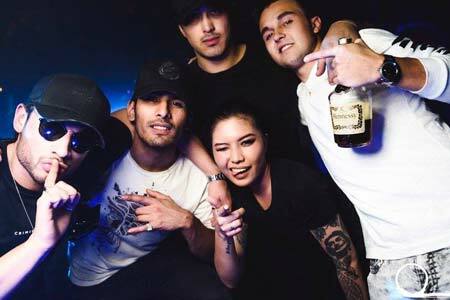 London Night Guide prides itself in being able to provide a complete information on the top clubs in London, so we have prepared the following Drinks and Bottle Prices Menu for Tape Club for your use in planning your night out. 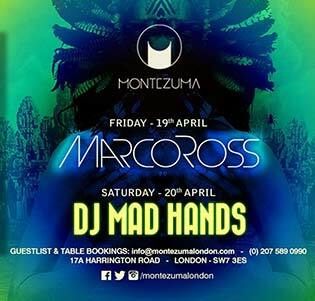 If you are on the Tape Club Guestlist, you must know that for standard tables, the minimum spend is £1000. On the other hand, if you have a Tape Club Table Booking for a VIP table, the minimum spend is £2000. With that out of the bag, here are the prices for the Tape Club menu. 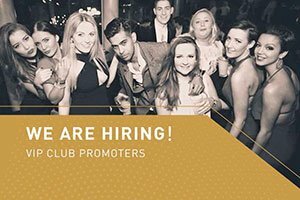 What is the Tape Club Bottle Price Menu? For champagnes, a 70 CL Spades will cost £650. The Krug is priced at £600 for a 70CL bottle, while the Cristal by Louis Roederer is pegged at £500. A Magnum Dom Perignon Vintage Luminous will set you back £1050, while the Jeroboam size will cost £5650 and would be enough for a party of 10-20. If you’re looking to please a bigger champagne crowd, perhaps a Methuselah of Louis Roederer Cristal is better and it will cost £35,000. This is an expensive drink, and usually ordered by Tape Club Celebrity guests. Rose Champagnes are also on the menu, which is usually the drink of choice for Tape Club Celebrity guests. A Magnum of Moet N.I.R will cost £2000, and a smaller 70 CL bottle of Krug will cost £650. If champagne on ice is more to your liking an order will be £450 on both High Rose and High Blanc. 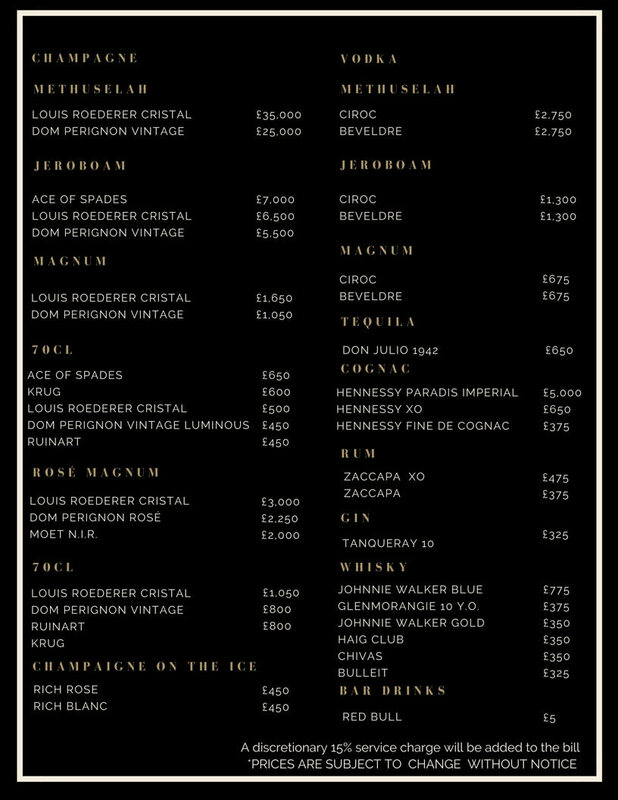 There are also Vodkas in the menu, and a Magnum of Ciroc is £675, while a Jeroboam of Belvedere is £1300. Don Julio Tequila 1942 is the pick of the usual party people, and you can have it for £650 per bottle. Hennessy dominates the cognac selection, and the price starts at £375 for Hennessy Fine De Cognac. The only gin in the lineup, the Tanqueray No. 10 is priced at £325, which is the same going price for The Bulleit Whisky. Johnnie Walker Gold and Blue also is available for £350 and £775 respectively. If you wish to mix Red Bull on your drinks, a can will cost you £5. Drink packages abound at the Tape Club, and you will be treated to a couple of options that you can choose from. We recommend getting a Tape Club Birthday Package deal for an amazing celebration, but you can also select from Vinyl, Radio, Cassette, CD, or MP3 packages. This can cost you from £1500 to £7500. We always advise our guest to follow the Tape Club dress code so you won’t have any problems getting into the club especially on busy days. 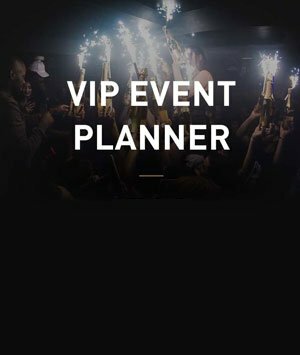 For more info on the top nightclubs in London, always check out London Night Guide, your premiere booking solution for the London nightlife. Also the Tape Club Entry Price is 20 after 11 PM.